Recent headlines touted the decline in marketshare being seen by smartphones on the African continent, and the concurrent increase in sales of basic devices. Yet a closer look shows that this shift might only be numerical due to the opening of new markets in heavily populated DR Congo and Ethiopia – first time buyers are likely to start with entry level phones. In fact, role of smartphones in Africa is not only likely to grow and evolve over the coming 3 to 5 years but its very likely that it will be connectivity apps driving their adoption. We Are Social’s latest report shows Africa’s internet user numbers have been growing by over 20% year-on-year. With connectivity and communication, commerce was expected to take off but anyone tracking the headlines would notice the challenges faced by African e-commerce platforms. Some point fingers to connectivity as the issue, expecting to reap benefits from scale of penetration. Others point to high costs of data and devices, or challenges with completing the transaction online. Looking at the patterns exposed by all the reports and the articles makes one wonder whether it’s the underlying assumptions and expectations that are the real problem. The untapped market is hyped out of proportion by each new entrant who rush in with their disruption to revolutionize the African consumer, only to rush back out again when the traction fails to succeed. This has been muddying the waters of what could have been a considered thoughtful opportunity to transform the social and economic landscape. Yet its not all negative. If someone was to ask me about how connectivity and communication are driving commerce in the African context, I’d point to the plethora of informal trade in goods and services being conducted daily across social media platforms. Everyday there’s a new product or service launched with a tweet. Groups on Facebook encourage and support the entrepreneurial journey. Cryptocurrency trading is making Kenya famous as a first mover. The difference in traction seems to be that which is self organized and organic vs that which is institutionalized and/or introduced from elsewhere. The external pressure to succeed in the same terms as that visible in the Silicon Valleys might actually be a greater barrier to the sustainable development of the African online community led commerce, increasing pressure on founders and startups with every negative headline. Maybe the lesson from the informal organic growth online is that might actually be a matter of throw the technology at them and see what emerges without lifting the lid every other second to check progress? Maybe all that is needed is more locally relevant content, such as already being seen emerging from Nigerian and Kenyan tech blogs, rather than the imposition of metrics and heuristics from developed nation contexts. Social Media Day 2015 is as good a day as any to finally get around to completing this post I’ve been meaning to write for almost half a year now. It is based on my personal experience and observations, supported by a few relevant links. African Twitter is unlike any social media I’ve experienced. In less than 2 years it has become a significant part of my life. Its a community and a conversation, both real time and asynchronous. Its warm and welcoming and very, very human. Its like going to a convivial office and hanging out with your peeps all rolled into one. And you can’t be serious about doing business in Africa without being a part of it. The paragraph above may come across as idealistic hyperbole, so I’ll try to break it down into chunks and explain. First is the purely subjective personal experience, followed by the bigger picture of African social media in the business world. Diving deeper into a proper ethnographic study of the African Twitter experience really should be done at some point. At this time, I’m hazarding guesses based on secondary sources and my own experiences. Also, given that my African Twitter timeline is business oriented, my network will reflect this rather than a purely social network. What distinguishes the African timeline is that the vast majority of people are connected far more closely to each other. Chances are, if you follow someone, then many others that you follow also follow them and vice versa. This seems to be the case regardless of geography and interest area. This could be due to history and demographics – Twitter isn’t as popular across the board as Facebook, for example, and early adopters are more tech savvy than the norm. This leads to a more or less coherent timeline and conversation stream, closer in experience to a conversation thread in a bulletin board or community weblog. In my older Twitter handle, with the exception of few social clusters which tend to reflect real world networks and/or LinkedIn connections or pre-existing connections through other, older communities eg. MetaFilter, most people, for the most part, are not connected to each other. Thus, its more fragmented, and for the most part, people are simply pushing out information or links or tweets. That is, its ‘talking at’ the world rather than ‘talking with’ the world. Its rarely an ongoing and coherent stream of conversation the way the African experience is more often than not. In sum, its far more of a social experience. From the less personal perspective, there’s already been recognition that Twitter is leading the way to greater integration across the continent – a pan African conversation if you will, as the Nigerians and Kenyans exchange daily tidbits with each other while all keep up with what’s happening on the ground in Burundi or South Africa. Its an immediate and real time conversation and replies and acknowledgement are part of the etiquette. This applies to corporates of all kinds as well as institutions, utilities and government departments. People talk directly to the airlines or holler for customer service from their mobile service providers. The African timeline is the everyday manifestation of that old concept of “Markets are conversations”, in a manner that I’ve yet to see in other spaces or geographies. In fact, just yesterday, Hotels.ng founder Mark Essien tweeted that his best source for new hires was Twitter, an observation quickly validated by others. Other startups have seen the value of the social, and social media is big enough business to garner cover stories. Global platforms may not see the potential for monetization – Facebook being a case in point – but the participants most certainly do. Increasingly, social networks provide the opportunity to scale your reach, and thus, your business. This post is only an appetizer, I’ll come and look more closely at this space. There’s a link between social media use and economic growth I want to explore. How social media can steal your soul. In January 2011, I began researching articles on the African economic rise and concurrent opportunities, for a series I was writing for Dirk Knemeyer’s GoInvo blog. Having just been introduced to Tumblr, I liked the real time capture ability of the application and the flexibility in tagging, for keeping track of quotes and snippets. I have been missing Delicious ever since the latest design change broke it. Now, 2 years later, I’ve got a monster I cannot kill and I must keep feeding it with new articles on Africa. There are more than 25,000 followers and its spotlighted in Tumblr’s directory. Even if 90% are spambots thats still a lot of people. I only ever needed it for 4 months of work!! We’ve finally reached the point in our work for Village Telco where there’s been enough time for some reflection after the intense weeks of travel and observations across Kenya. I can cluster our learning into three broad areas: our approach, methodology and team work; Kenya’s people and the informal economy; and finally, the role of the mobile phone and the internet across the country. Top of mind, what I would really like to do is take a deeper look at all the factors Why a social networking site like Facebook has become so popular – is it like Mxit, a far more affordable and convenient way to stay in touch with extended social networks or are there reasons beyond the obvious? Given the variance in socio economic backgrounds and education among all those who were active on this platform, I wonder whether there are learnings of value for the larger goals of what ICT can do to enable social and economic development. Instinctively I feel its not Facebook per se that is the critical factor, like a Mxit in South Africa or an Orkut in Brazil, it simply happened to be there. However, given my approach to increasing understanding of a particular demographic or validating a hypothesis, my first principle is to question my own instinct and subsequent assumptions. 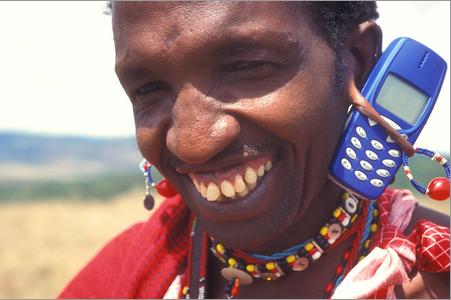 Our assumptions and inferences from the surplus of information and data available on mobile phone use in Kenya, for both online use as well as regular use, were seriously jolted. You could say we had the veil torn from our eyes. A future post that has been percolating is one that turns my entire thinking about the Mobile and the BoP upside down, from the point of view of “the mobile as a platform for social and economic development” for the individual. A big realization was that it was technically impossible for people to go online – if it wasn’t just the initial peek at Google or Yahoo or what have you – from their mobile device without visiting a cyber cafe (or using a computer) first. If you are a first time internet user and plan to use the mobile as your primary device to check your email and update your status in Facebook, you are unable – at this moment in time – to create your email account, and subsequently your Facebook page, without the use of the personal computer. The second was that very few of these new internet users were cognizant of the way mobile operators structure the cost of browsing and data bundles. Safaricom, the country’s largest operator, had at least 3 different prices that I’d seen on their billboards and posters – Ksh 4 per minute if you simply went online, Ksh 2 per minute if you sent an sms for data conversion and finally, purchasing a data bundle or browsing package (unlimited by the day or bundle) which brought the cost down further. Thus many reverted back to browsing at cyber cafes where at least one knew what one’s cost would be or could estimate it in advance. Consumer education will be more critical for the uptake of the mobile internet since it is currently not to the benefit of either the operators or the cyber cafes to inform users about their cheaper options. We sensed this, we discussed it with Steve Song and we also heard it from others with years of experience of doing business in Sub Sahara. Kenya, as a representative sample of Sub Sahara or even East Africa, is a very different kettle of fish, all in a good way. It wasn’t just luck that most of the cyber cafe owners we met around the country were enterprising, articulate and opportunistic. Neither was it chance that very rarely was I unable to communicate – at least the basics – in English, no matter where we went. Internet costs, mobile data and voice costs are significantly lower than in most countries and this factor, taken together with the maturity of the urban cyber cafe market and penetration of computing devices – laptops and desktops – meant that this was a very sophisticated market regionally. One cannot generalize our findings for other countries, in fact one would hesitate to do so. Rather, as we discussed with Steve, we’ll take Kenya as a leading indicator of shifts to come in the near future for the rest of the region. For example, VoIP as a service has atrophied into two or three neighbourhoods ever since international calling rates have stabilized at around Ksh 3 a minute (USD 3 cents or thereabouts) on the other hand, wifi is slowly demonstrating its future ubiquity. However, some other factors would also play a part in this – literacy is at 85% here; what kind of difference does that make when it comes to uptake and popularity of text based communication mechanisms such Facebook, email and of course, the SMS. Education makes a difference, since most of the time, even when passing by some of the technically most impoverished parts of the country, I kept feeling that it was in far better shape relative to similar locales in India. This is all good and bodes well for the future of the nation and the region – if I had to launch a wholly new product for the Sub Saharan market, I’d select Kenya for an environment with the lowest barriers to the adoption of innovation. The BoP market is sophisticated and mature while still demonstrating the core values and buyer behaviour seen everywhere else I’ve been. We learnt that no two projects will ever be alike and the only certainty is uncertainty. There are no prepackaged ready made solutions or processes for the challenges we’ll face in our chosen line of work, however we’re on the right path for discovering the ways and means to use the tools available at our disposal in order to best address them. Today, we’re confident enough to put it in writing that if you’re seeking answers to the unknown, in untapped or overlooked markets and when none of the regular methods and frameworks for addressing your marketing, strategy or design needs seem to work – give us a call or drop us a line. I believe we can help you. Kenyans have donated nearly $200,000 (£122,000) via mobile phone banking for aid to victims of the worst drought in the region in 60 years. The BBC’s Noel Mwakugu in the capital, Nairobi, says the money has been raised in the first 12 hours of an appeal launched by leading businesses. The appeal – involving mobile phone company Safaricom, Kenya’s Daily Nation newspaper and Kenya Commercial Bank – is intended to raise $5.4m. Over 6,000 Kenyans at home and abroad engaged in discussions in social media, Twitter and Facebook on how to deal with the crisis. They encouraged other Kenyans to contribute to the Kenyans for Kenya Initiative. There are layers that need to be unpacked but the obvious ones stand out – mobile phones, mPesa, social media, communications technology. But its far more than just that, and it may just be a signal indicator of a tipping point. Of what kind I hesitate to write down in words at the moment, I want to ponder it further and discuss with Muchiri who has far more experience in social media, social crm and of course Kenya than I do. But my first impulse I will leave you with, this little device has indeed become a post industrial platform for social and economic development, which is just another way of saying empowerment.